Remember the third-generation L200 bakkie built and sold here as the Colt in the good old days when Mitsubishi was still in cahoots with Mercedes-Benz? 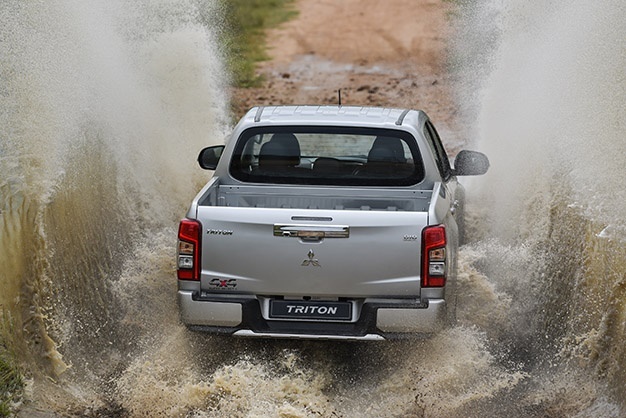 Well, the thoroughly titivated new Triton from the Japanese brand, now part of the Nissan-Renault Alliance, is reminiscent of this model – the last L200 model that really sold well in South Africa. 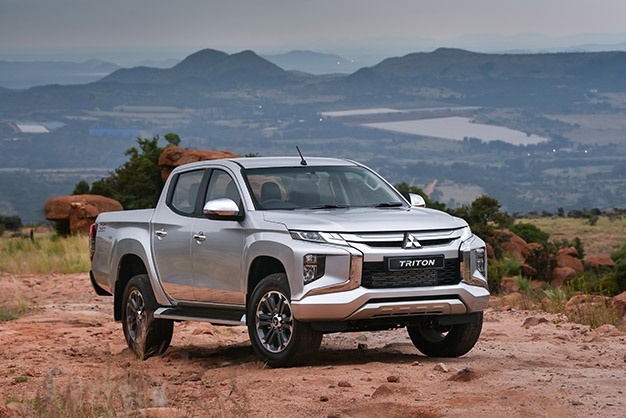 Actually; the striking latest incarnation of the fifth generation L200 (the Triton name was introduced to South Africa in 2006 with the launch of fourth generation Mitsubishi bakkie) shows what the Triton should have featured when it was launched here only two short years ago. Gone are rounded surfaces and shape of the last two-and-a-half generations, and back is the angular looks of its first two predecessors – in part due to the new Dynamic Shield design direction already incorporated in the new Eclipse Cross and Outlander ranges. Striking design This striking, more powerful design job forms one leg of a triad of improvements, as Mitsubishi used the makeover opportunity to also introduce enhancements to the automatic transmission and already class-leading 4x4 drivetrain, as well as some small cabin updates. The higher hood line, the higher located and beefier-looking headlights, more pronounced grille treatment and angular front air inlet and larger, squared front bumper gives the new model a powerful and imposing appearance that even Ranger Raptor or Hilux Dakar owners will find intimidating. The newly sculpted body curves are more edgy, with sharp, contrasting lines, while extended wheel flares and bright accents adds strength and a modern twist. It carries through to the rear, with new, angular rear lights that frame the front and rear design and add visual width. 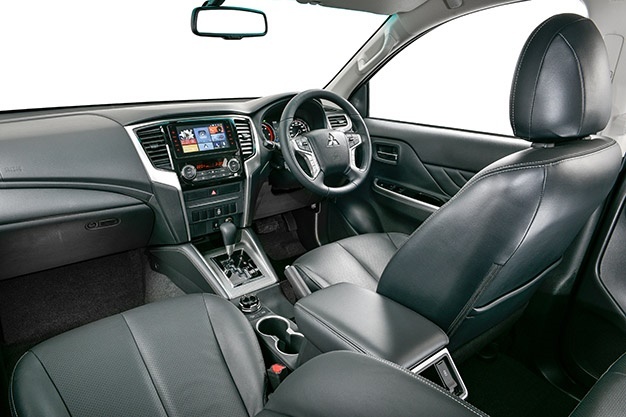 Mitsubishi claims the latest version of the Triton has also received a major upgrade to the luxury and comfort of the cabin. While the restyled inside, with new frame surroundings for the switch panel and air outlets, and softer materials used for the centre console, armrests and parking brake, is certainly an improvement, it is still not at Amarok or Ranger level. While the centrally mounted Infotainment System includes a touch-screen radio/CD and MP3 player with Bluetooth and hands-free voice control, navigation and Apple CarPlay and Android Auto is optional and amenities such as auto headlight control are not available. However, the interior does have an ambience of higher quality while expressing a modern and robust feeling. A host of active safety and driver assistance systems, including seven airbags, Isofix child seat anchors and auto door lock, were carried over, with some enhancements such as a rear-view camera, keyless operating system, high-mounted rear stop lamp and a soft-sprung tailgate. On the road…The extensively revamped newcomer is still powered by the tried and tested 2.4-litre MIVEC DOHC turbodiesel engine introduced with the fifth-generation model range in 2015 (it was the initial unavailability of these engines that led to the local launch of this model Triton being delayed for nearly two years). Delivering an impressive 133kW at 3 500 rpm and 430Nm of torque at 2 500 rpm, I rate this common rail direct injection mill as probably the best in its class – and now being combined with a 6-speed automatic transmission with Intelligent Shift Control (compared to its predecessor’s 5-speed ’box) its good attributes are further emphasised. As we experienced on the launch route in the Muldersdrift area of Gauteng, the new transmission in the auto model allows for smoother acceleration and more quiet operation, offering shift points that balances optimum engine power and tractability well. Yes, it’s still not as smooth as some 8- and 9-speed executions but proffers the best compromise in terms of cost versus operation performance. According to Mitsubishi, the newcomer uses larger rear dampers with more damping oil to improve ride quality but on the route, there was no perceivable difference in driving behaviour and ride between the new Triton and its precursor. However, braking performance and feel are improved with the use of larger front discs and calliper pistons. Off the road…On a compact and technical off-road route consisting of rocks, gravel, mud and some serious inclines the new Triton really came into its own. With a ground clearance of 220 mm, an approach angle of 28º, a departure angle of 23º and a ramp breakover angle of 25º, it made short work of the obstacles, and while its turning circle of 5,9 m is not best in class, it proved to suffice when negotiating short, cambered corners. Fitted with Mitsubishi’s advanced Super Select II 4WD system the auto model also employs Off-road Mode with settings for Gravel, Mud/Snow and Sand and Rock (in 4LLc only), delivering optimum traction on different road surfaces by integrally controlling engine power, transmission and braking to regulate the amount of wheel slip. The latest version now also provides for Hill Descent Control (HDC); electronically controlling vehicle speed when negotiating steep or slippery descents – and the well-selected software settings chosen by Mitsubishi made0 this system a pleasure to use. It is best in class, as it kicks in virtually undetected with the vehicle (while the driver keeping his foot away from the brake) smoothly and uninterrupted descending down the rocky road. And yes, the additional Rock setting in 4LLc makes the new Triton virtually unstoppable. Best of all is its competitive pricing. While it may not have all the bells and whistles of its competitors the new Triton matches them where it counts while undercutting some on price by quite a margin. The flagship Triton 2.4 DI-DC A/T 4x4 model is now available for R589,995 – compared to R637,500 for the comparable Toyota 2.8 GD-6 4x4 Raider 6AT, R625,500 for the Ford Ranger 3.2 TDCI XLT 6AT 4x4 High-Rider (without trade assistance), R615,000 for the Isuzu D-Max 300 LX 4x4 auto and R626,500 for the Nissan Navara 2.3D LE 4x4 AT. This includes Mitsubishi's manufacturer's warranty of 3 years or 100 000km, a 5-year/90,000 km service plan and 5-year/unlimited mileage roadside assistance. Not bad for an imported vehicle not benefitting from any rebates. However, service intervals are every 10,000 km. 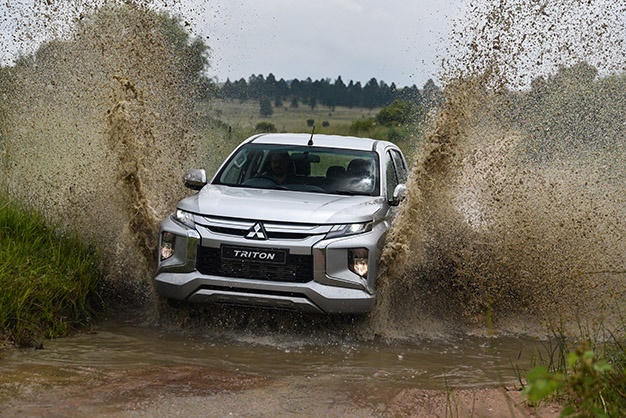 Says Nic Campbell, General Manager of Mitsubishi Motors South Africa: "The new tough-looking Triton is significantly more competitive and meets the diverse needs of bakkie customers around the world. It features a host of enhancements and refinements making it even more durable and reliable for commercial users and giving leisure users the comfort and ride they desire." Taking all this into consideration, as well as its competitive price, the newcomer deserves to do well in the hugely competitive double-cab bakkie market. However, a lot will depend on the promotional effort put behind it in a depressed market.